Last week, after the epic cocktail party, we hit the road first thing the next day (after I took the glassware back to the party rental place). Destination: Link Lake – where the ice has now melted and spring/summer is well underway. Not much to report really, except that we met the building inspector (who happened to be in the area when we arrived on Monday), got Internet installed (thanks to China Creek Wireless – great customer service), met our builder to discuss work for this building season, and lit up the new woodstove and “cured” the paint. We also hauled a cast iron sink up there for later use, and Brian did a bunch of cleaning up of building scraps and garbage which we hauled off to the dump in two loads. Work planned for this summer includes: Loft, deck and stair railings, insulation, exterior cladding – plus two inspections: framing and insulation. Next summer will involve some interior finishing, and exterior painting. The summer after that will likely see the end of major interior finishing the then we will have to deal with the question of water/septic/plumbing in order to pass final inspection. It’s really a five-year project in terms of money and time (each year allows us to pay off more of the line of credit for the next year) – but now that I have broken it down in my mind this way, it seems a lot less overwhelming. Also, we are at the point where we have a very usable structure for summer (electricity, stove, roof, basic cooking gear set-up), and after the insulation is in, will also be winter-ready – which means everything else can get done on its own time. And for the record, this week marks two years exactly since I saw the ad for the property on Landquest, next Monday will be two years since first saw the property. We haven’t done so bad for ourselves to go from overgrown lot with a fallen-down cabin/tipped-over outhouse – to a place where we can sleep inside or set up tents (we have two tent platforms plus a level front yard now). It’s definitely going to be as much time as possible at the cabin this summer! 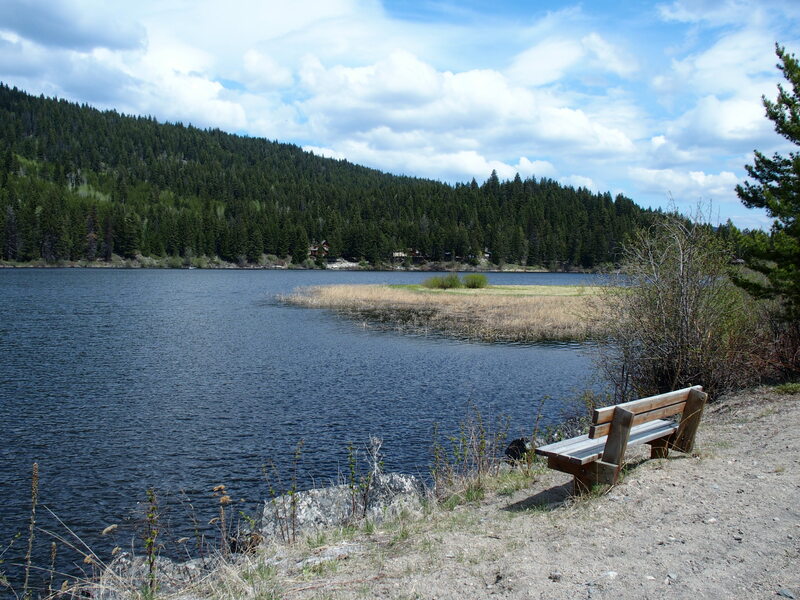 This is a picture of Osprey Lake which is around the corner from our cabin on the KVR.